That is how you become a better musician! 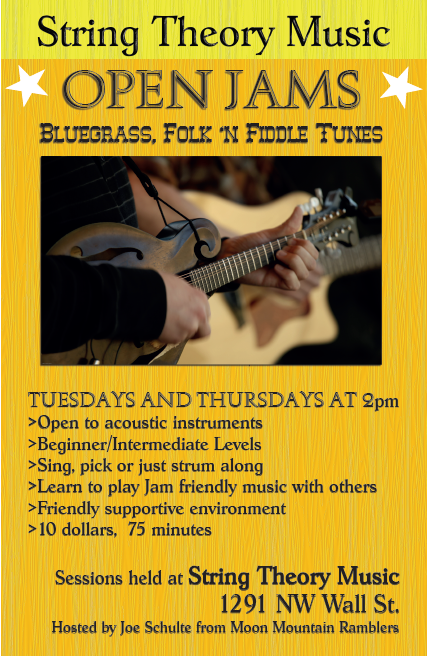 Whether you work by yourself or take private lessons, no matter what style of musician you are or want to be, the musical knowledge you can attain from playing jam-friendly standard folk music with others in a friendly environment is invaluable. Learn how to use your ear, play and improvise with songs you may or may not even know, and follow the basic language of musicians. No matter how diligently you train on your own, there is nothing like being a part of a larger unit and learning about everything that goes into jamming well with others. The world of music is so infinite and sometimes overwhelming, jamming is a great way to get a grasp on what it is you want to do as a musician, even if the music at the jams is not necessarily your "cup of tea." You will finally understand the value of those pesky scales and musical theories that music teachers try to push on you, you will see how much theory goes into even the simplest of songs, and, most importantly, you will realize that even a beginner player with the most basic of skills can play with advanced musicians and ENHANCE the overall sound and experience for everyone! Please contact us if you have any more questions or need help deciding if these jams are right for you!